The 2016 Tory conference will go down as a landmark moment. I fear it will come to be seen as the signalling of a chilling new “class war”. On the surface the language could be heard as optimistic, with talk of opportunity and investment and everyone benefitting, and “Hard Brexit” being tough but good. But the scarcely-concealed panic should be ringing alarm bells. Austerity abandoned, money to be borrowed for investment in housing and infrastructure. That sounds like a Keynesian reaction to an impending economic catastrophe induced by Brexit. Is that catastrophe what people voted for? It is worse than it seems beucase the world economy is not in good shape. Things have stabilised since the crash of 2008, but levels of debt are still very high and it is far rom clear that we are not simply in the “the eye of the storm”. This is not a time to be making things worse for ideological reasons. The tragedy is that people are still supporting Brexit. In June people were sold a set of lies and misled into voting Leave, and the lies continue. We’ve heard Farage talk of the EU declaring war on the UK, and strident comments from the Tories about “getting a good deal for Britain” while our European partners are pointing out the weakness of our negotiating hand with gentleness but unmistakable firmness. It’s a masterplan. Those who have already lost a lot and voted “leave” in desperation are hearing buzzwords like “opportunity” and “investment” and “control” and “securing a good deal”. The reality is looking very different. These are the people who stand to lose a lot. Having voted overwhelmingly to Leave, people in Sunderland are petitioning for support to stop Nissan leaving (which is a direct result of Brexit), but the stream of stories of people likely to lose out has not been enough to drown the Tory Brexit rhetoric. It’s chilling. People who stand to lose most are being duped into supporting it. There are chilling reminders of Margaret Thatcher — another Tory leader who used inclusive-sounding language while presiding over a deepening of divides in British society. Brexit wouldn’t/won’t be all loss. Skilled traders on the currency and stock markets stand to do well out of the volatility. There has been particular resentment of these people since 2008, and we are being duped into acting in their interests. Unscrupulous employers stand to gain from attacking workers’ rights. Not good for workers, and not good for stable business with long-term vision. The wealthy tend to stay at the top of the pile. Others will struggle much more. Thatcher was right that some can adapt and do well. Others don’t. The constituency where I stood in May 2015 included Coalville — an ex-mining town that was hammered when the pits closed and has yet to bounce back. Do we really want to see Brexit ghost towns in 30 years time? In Thatcher years there was talk of “Basildon man” to describe people losing out under Thatcherism, who nevertheless voted Tory. The theory was that they are voting for the wealth they hoped to acquire, but didn’t. Now we have support for Grammar schools from people who hope their children will go there, neglecting the fact that most won’t. The reality of Brexit, especially a hard Brexit, will be grim. People voted Leave on lies and are being mobilised on more false promises. It’s a great way to mobilise support for the Tories. The cost will be big, but fall on others — not least traditional Labour voters. We have the horrifying con trick of getting people to support what harms them, to the benefit of a Tory Brexiteer clique. Paddy Ashdown tweeted ahead of the Conservative conference that “the Tory Brexit brownshirts are stirring”. He had a point. 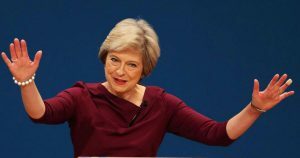 May’s conference speech at the end was a virtuoso performance of “post-truth politics” calibrated to wolf-whistle support without people stopping to think. This is not good news. It reminds me of Hitler’s advice on political propaganda “not to appeal to the so-called intellect, but to concentrate on rousing the emotions of the masses”. Chilling, and disastrous for most people.